One of the early features of the Community that proved particularly popular was the option members had to post their designs or CAD models for others to see and comment on, which would grow into the GrabCAD Community Library. “Designers love to show off their work, but there were no good online solutions for that at the time,” Olli said. That seemingly simple enhancement changed the focus of the young company and a decision was made to focus on developing the online Community so members could better connect and share ideas and content. The Engineers section of the site allowed members to include biography information and their specific areas of expertise and interests. The options to ask members of the Community questions and post “how-to” tutorials were also added as a way to enhance the spirit of community and education. In December of 2011, GrabCAD would hit 1 million models downloaded from its Community. Many of GrabCAD’s earliest members were attracted to that sense of community and collaboration, which is why so many of them still remain active members to this day. 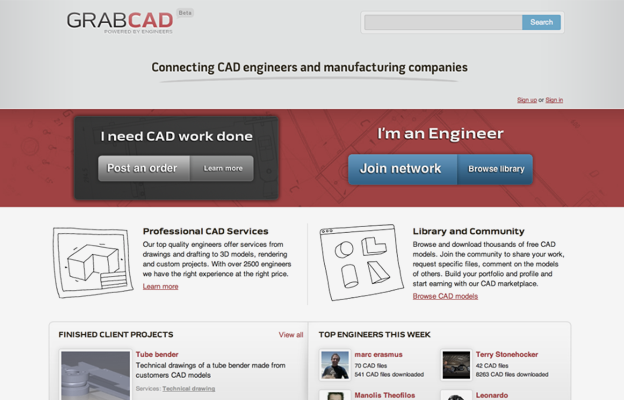 In fact, it was the early emphasis on the connectivity of the Community and the direct feedback received from members that helped shape and grow what would become GrabCAD’s next offering: GrabCAD Workbench, an online engineering project and CAD collaboration solution. Next week, in our second blog on the history of GrabCAD, we dive into how GrabCAD Workbench changed the game for CAD collaboration. Want to help GrabCAD celebrate hitting the 4 million member milestone? Go here to find out how to sign up and take part.